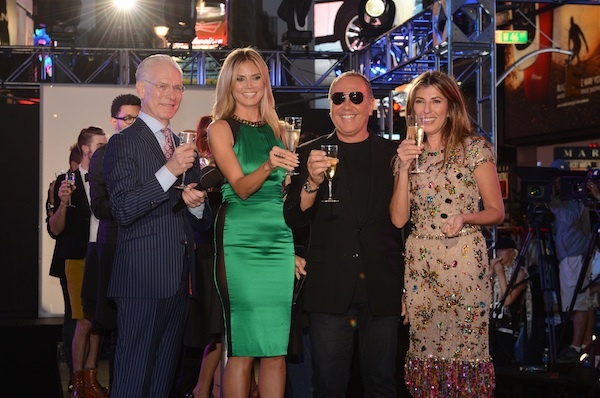 Season ten of Project Runway has come and gone. A new winner has been named, and Season 11 is already in the works. I have loved being a part of the Project Runway Style Network of bloggers. [Severus Snape Dmitry Sholokhov, winner of Project Runway Season 10] A few weeks ago I had the privilege of jumping on a conference call to interview both Nina Garcia and Tim Gunn the day before the season ten finale aired. Nina was well spoken, kind, and charming, and Tim... oh, Tim. He very well could be America's most beloved reality television personality (aside from Honey Boo Boo, of course). He was honest, thoughtful, and exactly how he appears on the show. You'll be happy to know that in the name of professionalism, I fought every urge to ask Tim to adopt me and to beg Nina for a job. While most of the interviewers asked questions about the particulars of the finale, I was more interested in the behind the scenes info and funny details of the show. 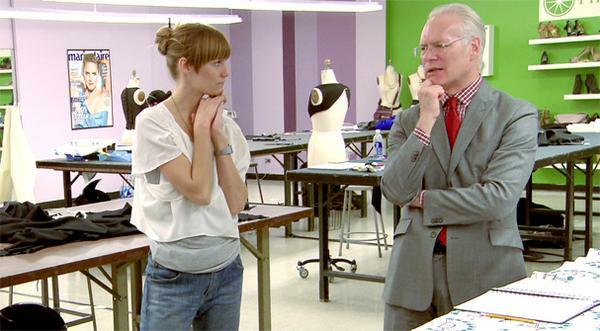 Now celebrating the wrap up of it's tenth season, Project Runway is an institution in competition reality television, but before it began, Nina wasn't so sure of the show's success. She says, "I thought it was a crazy idea. I thought nobody would be interested in fashion. I was a little skeptical." That is, until she saw the winning combination of Project Runway's judging trifecta of Heidi Klum's modeling perspective, Michael Kors' design perspective combined with her own editorial perspective. "When I really saw all that come together I thought, 'Okay. Fine. This makes sense.' 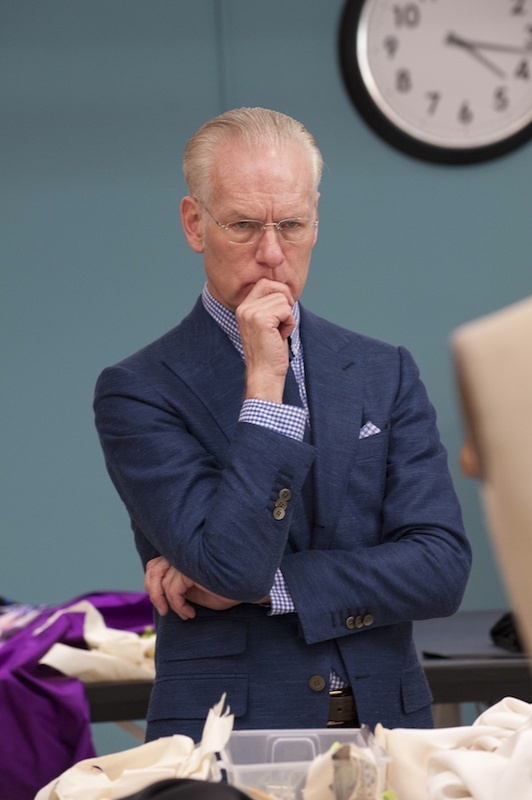 And of course, let's not forget Tim Gunn who perfect and is a perfect mentor." It's her editorial perspective that makes her particularly honed in to how a designer presents their garments. It's why Nina is known to critique a contestant's styling. "[Issues with styling] is something that designers-- real designers-- deal with all the time." Is it important? Absolutely, she says, "because they will turn out a more polished and concise message and it will make the presentation of the show." Tim, on the other hand, says, "I'll just be blunt. I feel that [styling is] just an enhancement. For me it's all about that garment. Unless the accessorizing is an extraordinary distraction in a bad way, I would never comment on it at all, but the judges seem to have a very different take. There are times when it's all they talk about is the accessorizing, and I just want to say, 'Be quiet, look at the clothes!'." I think that sounds like sage advice, and it's because of his candor that I often wish that Tim were a fourth judge. In episode nine of this most recent season, Tim was called in to give his opinion for the very first time. When Ven mentioned he had scrapped his initial design per Tim's advice (who incidentally referred to Ven's first dress as an "homage to a menstrual cycle"), Heidi called Tim to the judges' row to weigh in. Of that experience, Tim says he never imagined that would end up on the show, but he did it because he had ulterior motives, "I had a very dastardly motivation and my motivation was 'oh good, I can talk to the judges and help Ven go home this challenge.' And it didn't work, and it ended up being Gunnar, and if I had known that I wouldn't have agreed to talk to the judges. I've never done it before although Heidi often says, 'I wish I had a red phone next to my chair so I can call Tim.' I mean, I'm always there. It's not as though they can't shout out to me, but my refrain is, 'Sorry, Heidi. Separation of church and state." This deliberation process takes one quick commercial break on our side of the edit, but in real time, deliberations are much, much longer. They take so long that comfort is one of two deciding factors for what Nina decides to wear on the days she is on set. "I try to keep in mind what looks good on TV and what is comfortable, which not always goes hand-in-hand, but I try my best." And just how long do the deliberations typically last? "The deliberations by itself takes, I think, a good two hours and you just see little snippets of it." It makes you wonder what ends up on the cutting room floor. Tim believes the editing is done in an extremely flattering way. One such example is season eight's home visit with Gretchen Jones. "The editing on the show is kind to everyone. Kind," Tim says emphatically, "The home visit that was so dramatically edited was Gretchen, the winner of season eight. Her mother-- I mean we're playing crochet-- you don't see any of this in the edit-- her mother kept knocking my crochet ball across the street into the traffic so I had to run across the street to retrieve it. I'd bring it back and she'd slam it again. It was so hostile and angry I couldn't believe it and thought, 'Well, the mess doesn't fall far from the tree.'" Tim has never swayed from his opinion that (my dear) Gretchen should not have won season eight, but Gretchen isn't the only one in Tim's cross hairs. "I have not been particularly happy with the outcome of the last couple of seasons, and I don't want to denigrate Anya [season nine's winner] but I thought Viktor Luna's collection was definitively stronger and I was stunned that he didn't win." So what does make a collection a winner in the judges' eyes? For Nina, it comes down to creativity, authenticity, and wearability. She says, a winning collection "is creative, meaning that I haven't seen it before, it's [the designer's] own point of view, women will be able to identify with it, and retailers are going to be interested in buying it. At the end of the day clothes are meant to be in a store; they're not for a museum." Tim says, "I always say to my students it's not about a pretty dress. Do we want the dress to be pretty? Well, of course, but it's about the larger context in which you're designing and creating." If that sounds like a challenge you can rise to, both Tim and Nina offer their advice for auditioning for Project Runway. "Be who you are because if you present yourself as someone you're not then the likelihood that you can sustain that on the show is unlikely. Just be who you are and be proud of that and don't be someone you think that the producers or judges will want to have on the show. Just be yourself," impores Tim. "Put together a very concise collection and portfolio of your collection. Be very motivated and focused and articulate well when you present," says Nina. Season 11 of Project Runway is already in the works. "I think you will enjoy it," Nina says, "There's not much to tell you that I can tell you right now-- just that there will be some twists and turns and surprises in store, but they're all good." So what's in store for the show after season 11? Nina (as well as fellow judges Michael Kors and Heidi Klum) and Tim have done every season of Project Runway so far. Will they be a part of the show forever? "Well, we'll see," Nina laughs, "I'm not going to be out there in a wheelchair. I mean we joke about it that we're going to be like 20 years from now, 'Oh, hi, Michael. Please push my wheelchair'." "As long as there is Project Runway, I'll be there, even if I'm in a wheelchair or an iron lung," assures Tim. And as long as Tim's there, I'll be tuning in, iron lung, wheelchair, or not. Hello, 2013. Let's not be strangers.